In years gone by, automotive air conditioning was a luxury, an added bonus, and while the lucky few chilled in an ambient temperature, the rest of us were left to freeze or sweat it out with the car’s dodgy fan blower. No longer the case, since around ⅔ of all cars now arrive on our doorsteps complete with some kind of climate control system. Like all other parts of the car, if you want it to function properly, you must keep it maintained. But how? And, more importantly, when should you recharge your car’s air con unit? For those looking for a quick answer, every 2 years is a good guideline, although this will vary from model to model and it’s always best to check with your manufacturer’s handbook. You might even notice when your air con changes. It might not feel as cold as usual or seem to take longer to reach your required temperature. Both signs that a re-gas is on the cards. Don’t leave it until the last minute, though. While it’s usually easy to book your car in for and air con service, you might find yourself experiencing a couple of uncomfortably sticky days in the summer while you wait to find a convenient appointment. 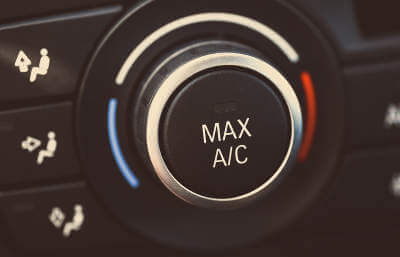 Around 10% of a vehicle’s air con refrigerant leaches from the system every year, requiring your car to work harder to produce air to the required temperature. This places unnecessary strain on the engine and increases fuel usage so from an economical point of view, you’ll be quids in after a recharge. With reduced lubricant in the air con system, parts will wear prematurely, perhaps resulting in expensive replacement costs so it’s important that this is also replaced along with the coolant gas. As with all things automotive, time has a negative effect: parts often crack and seals can break. During the air con service, technicians should check the integrity of the system, looking for leaks or anything that might cause compromise. While the replacement of these parts will not be included in the cost of the re-gas, you will at least be given the option for any issues to be addressed. The process takes about an hour which means that it’s a job you can schedule in during lunchtime or after work, with some garages opening until late evening. Some technicians will even visit you at home or work to complete the service wherever is convenient for you. At a cost of around £49 every 2 years, it’s a task that shouldn’t be overlooked and could actually save you money in the long run. Climate control systems are not something that is covered in your car’s regular service, they should, however, only be maintained by qualified personnel as the handling and storage of refrigerants is a tricky business. With this in mind, air con re-gassing isn’t a job that can be done with a quick pop of the bonnet and bottle from the local auto supply shop! Automotive chains, dealerships, independent garages and specialist vehicle air con engineers can all deal with the job efficiently and to manufacturer guidelines. Get a free, no obligation, competitive quote today before you’re left out in the cold or burning it up in your car. You’ll be able to choose a convenient location and time as well as decide on the right price for you. Quickly, easily and reliably.